I have been teaching Face Reading classes for many years and in several countries (England, Belgium, Holland, Australia, Canada and the United States). 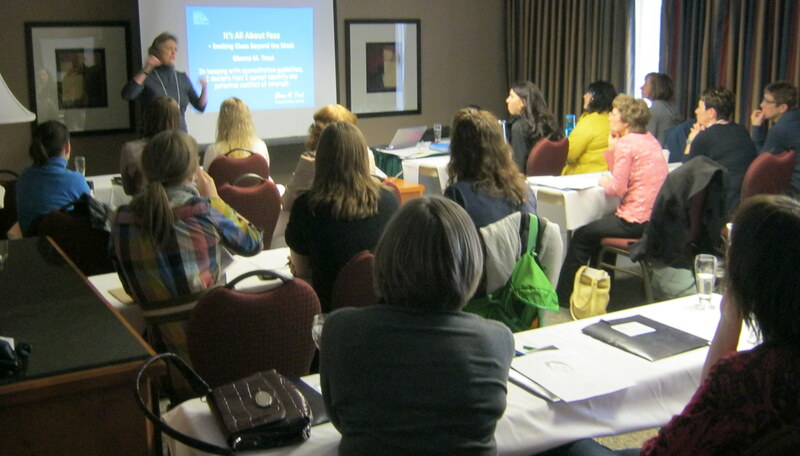 The above picture features an attentive audience at a Workshop during the 2012 Rural Nurses and Doctors Conference in Banff, Alberta, Canada. Please contact me if you are interested in organising or attending any of these courses. ‘It’s All About Face’ – an overview a four hour session or full day overview. Face mapping tools that are used in law enforcement, mental health, government, educational and commercial organisations worldwide. Recognise and understand masks or facades people project in comparison to who they are (and how they feel) on a more personal or private level. By practising the use of these face reading tools, it is possible to gain a deeper understanding of all individuals (your ‘self’ included!). You will be able to recognise such attributes as how consistent they are (or are not); how they feel about themselves and others; how best to approach each individual to maximise the most positive interactions possible. How to recognise and understand the masks people put on to obscure the more personal and private aspects of who they are and how they feel. You’ll have the chance to practice using these skills, and to learn how to use the new information you’ll have on those around you to become more effective, both at work and socially. Introduction to It’s All About Face (Basic Face Reading Skills) 3-day series of classes. This course consists of a 3-day series of classes. By the finish of this course, class participants will have a basic overview of four of the five face reading tools I teach. Time and exercises are designed to encourage practice in recognising emotional expressions, become familiar with mirror imaging, have a basic idea of facial features and their associated meaning as well as a basic understanding for face mapping. At the end of day three, time allowing, volunteers can have their face ‘read’ by others in the class and Glenna. Beyond the Mask – Advanced Face Mapping An intensive one-day course. Only available to students who have attended a 3-day Introductory course. By combining and comparing this information you can form an in depth overview of an individual. Seeking Clues Beyond the Mask – Introduction to Personality Profiling An intensive one-day course. Only available to students who have attended the 3-day Introductory classes. We spend a full day exploring major personality types and learning how to use recognition of personality traits to increase observation skills, improve communication as well as gaining a better understanding of behaviours and the belief systems behind an individual’s chosen actions. Advanced Personality Profiling – deeper exploration of each personality A series of 9 one day classes. Only available to students who have attended the ‘Seeking Clues beyond the Mask’ course. While personality is shaped by many sources, the single most important factor in shaping personality is the family we grow up in. During this nine-day course (training days are normally spread out so there is at least one week between each session), we take a look at the earliest formative years where an individual develops strategies and skills in order to fit in with the expectations of the family and win parental approval. Through a process of early emotional imprinting, based largely on facial expressions of primary caregivers, a child makes meaning or develops personal understanding of objects, events and situations. These patterns and beliefs often become our own “filters” through which we view, experience and react to the world around us. Each session provides a rich opportunity to learn what types of experiences form each personality type, how to recognise the personality ‘type’ by facial features, understanding and empathy of how individuals become ‘stuck’ in negative belief or behavioural patterns and steps for positive intervention. Looking Behind the Mask of Sanity . . . and finding the ‘Ice Cube’ who does not bond with empathy. Must Life Always Be A Struggle? Do you know anyone who sabotages their successes? What Is It About Being A Bootstrap? “Look at Me!! !” Do you know anyone who is a bit too self-focussed? How can someone with such a beautiful smile have so many issues? Do you ever feel like you have been taken in by that HUGE smile? What is it about the SLIM personality? Putting It All Together – the mix, match and blends of all the personalities – how does it fit? 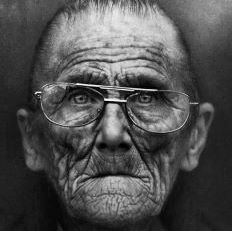 My half or one day ‘Overview’ course will introduce you to the tools that I use to divide a persons facial features and how these help to provide an immediate insight into their ‘public’ and ‘private’ side. The three one-day (Introductory) courses will help you identify all the facials features and provide the confidence needed to accurately ‘read’ faces. Beyond the Mask – Advanced Face reading, including Personality profiling helps provide deeper insights in facial awareness. What do you see in his face? If you would like to know my reading of his mans face please e-mail me. Workshop format – Each training event can be tailored to specific needs, however requirements include a suitable venue, multi-media projector (which Glenna can attach to her laptop) and a screen (or smooth, light-coloured wall) to project images onto. Glenna has a wealth of experience as a keynote speaker at conferences, public and private functions, exhibitions, personal growth seminars and awareness raising events. Please contact Glenna to discuss details.